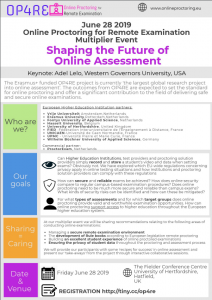 We invite everyone interested in e-Assessment in Higher Educations to join us as we share the final outcomes from our 3-year Online Proctoring for Remote Examinations (OP4RE), an Erasmus+ funded project. The ‘largest global research project into online assessment’, the outcomes from OP4RE are expected to set the standard for online proctoring and offer a significant contribution to the field of delivering safe and secure online examinations. The outcomes are relevant not just to other European countries and our EU funders, but will be of broader international interest as well. Note: This event is free. The organization reserves the right to charge a no-show fee (€50) in the event of an unannounced absence (five working days in advance). See the flyer for our event. 9:45 Talk What is Online Proctoring in Practice? 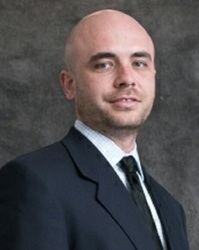 Adel Leo has been with Western Governors University for over eight years and has initiated, worked on, and executed some of the university’s larger projects. These include the architecting, engineering, and rolling out of WGU’s online proctoring process with multiple vendors while strengthening and improving our on-site test delivery process. Currently serving as senior manager of assessment solutions, his responsibilities include vendor management, assessment security, and department projects. 14:00 Workshops and demonstrations from OP4RE teams Workshops and demonstrations to be announced. 15:00 Panel discussion + Recipes for success in Online Proctoring Opportunity to ask questions to project teams. Several teams will share their success stories of experiments conducted during the project.